This is just upsetting to me. Honestly what the heck is going on with these people. they must be like, “We got to make sure Lebron stays happy so he doesn’t leave. So what should we do? I got it, yeah lets bring the Big Diesel to help out! Are you crazy? Shaq is a walking nightmare for any superstar on any squad. Who wants a 7-1 tall Center, who is definitely a “has been”, who still has an enormous ego as if it was 1995? I say Lebron won’t! Shaq cannot help anyone win a ring, anymore. He is fat and washed up. I don’t care what anyone says, this is a bad Idea. Yes I will admit that the suns have helped him get back into better shape, but Shaq has never had a hard work ethic so I just don’t see him getting better in the twilight of his career. I mean really man just look at his free-throws, if he worked hard he would be able to hit them by now. 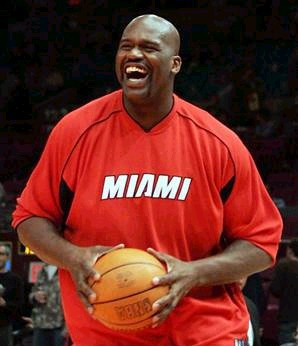 Shaq has a long history of not even showing up to mandatory team practices! He is the last thing I would bring to a NBA finals contender! I was reading my friends site http://americaswhiteboy.blogspot.com and he had a great post, which spurred this entire article. I still cant believe my eyes. This stuff is really happening! Shaq is moving and I just can’t understand what for. This guy is a BUM!